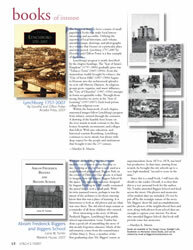 The Images of America Series consists of small paperback books that make local history interesting and accessible. Utilizing the expertise of local historians, each volume assembles maps, drawings, and photographs in a volume that focuses on a particular place and time period. Lynchburg 1757-2007 by Dorothy and Clifton Potter is a fine example of the series. Lynchburg’s progress is neatly described by the chapter headings. The “Seat of Satan’s Kingdom” (1757–1806) gradually gives way “Tobacco Town” (1807–1856). From the tremendous wealth brought by tobacco, the “City of Seven Hills” (1857–1906) begins to blossom into the architectural splendor we now call Historic Districts. As religious groups grow, organize, and assert influence, the “City of Churches” (1907–1956) emerges in forms recognizable today. Through those strong churches we arrive at the “Seat of Learning” (1957-2007). Each local private college has religious roots. Within the framework of each chapter, annotated images follow Lynchburg’s progress from infancy onward through the centuries. A drawing of the humble ferry house on the river stands in stark contrast to the fine homes, hospitals, monuments, and colleges that follow. With arts, education, and historical tourism flourishing, Lynchburg continues to move ahead, but always with deep respect for the people and institutions that brought it into the 21st century. Without the building, the space seems smaller—or at least it seems that way to me. Looking at the lot that is now used as a neighborhood playground, Biggers Park on the corner of Fifth and Clay streets, it is hard to imagine how the former Biggers School fit the space. The imposing structure designed by August Forsberg in 1881 totally consumed the parcel that is now a small park. With its twin mansard towers, perhaps it was the intent of the architect to let those entering know that this was a place of learning. It is bittersweet to look at old photos and see what was once there. The old school steps remain as a reminder of all those children who entered. Since this is a small book, I will leave the details to the reader. Overall, it is clear that this is a very personal book for the author. Mr. Tomlin attended Biggers School and lived across the street. His photos and memories of his student days are included. Do not be put off by the nostalgic nature of the story. Mr. Biggers’ short life and accomplishments, and the photos of the neighborhood then and now, along with photos from school days are enough to capture your interest. For those who attended Biggers School, this book will provide some fun memories. Books are available at The Design Group, Starlight Cafe, Bookstore on Memorial, Givens Books, and can be ordered by email at BiggersSchool@verizon.net.